One of the newer digs in the 10th Mountain system (and the only one located north of I-70), the Eiseman hut will reward powder junkies. 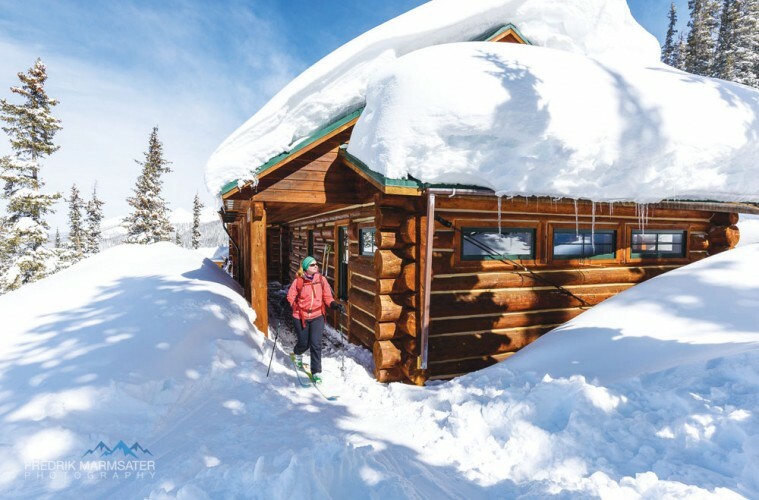 This grandiose hut, complete with vaulted ceilings, stunning views and sleeping space for 16, sits at 11,180 feet amidst some of the best turns in the state. We recommend making a loop out of your visit by ascending the steeper, narrower trail from Spraddle Creek and descending via the Red Sandstone Creek road. To book, go to huts.org. The route begins just beyond the ranch buildings at the small trailhead parking area and follows the Spraddle Creek Jeep Road for about two miles. The road heads east and then climbs switchbacks northwest. Stay on the right side of the creek and stick to the road as it contours along the drainage. After about two miles, you’ll reach 9,600 feet. Look for blue diamonds that indicate the trail diverges from the road and heads north (left) onto a hillside that gets ton of sun and therefore may have thin snow depending on time of year. From here, the trail drops to meet Spraddle Creek. After you cross it, follow the route as it cuts sharply west and climbs up the ridge between Spraddle and Middle Creek. From the ridge, the route heads north and gradually descends into Middle Creek. Complete this challenging descent, which often requires navigating over downed trees and debris, and begin climbing again to regain the elevation you just lost. Soon after you cross Middle Creek for the first time, the terrain mellows and you curve east. Revel in the sound of rushing water and snake along this beautiful creek. After 5.5 miles, you’ll reach the end of the valley at 10,500 feet. From here, the trail begins to climb very steeply up and switchbacks to the north as you gain 700 feet in the last 0.7 miles. Enjoy the climb: The hut rests just on the other side of the ridge. When you reach the hut, take a few moments to relax on the giant sun deck or to cozy up near the fire. Explore some of the best backcountry skiing in the state from here; below the hut, you’ll find 1,000-foot-vertical runs complete with glades and tight tree skiing on moderate-to-steep terrain. For the easiest route out, hit the first road switchback. It’s about 100 feet below the hut on the slope to the north. Follow the blue diamonds and/or your GPS or map to stay on the main road. Cruise down the road for 4.7 miles until you reach the road junction at 9,700 feet, just beyond a gate. Head south (left) and continue following the Red Sandstone Creek drainage. After 5.9 miles, you hit a second junction. Stay left. Unfortunately, your journey is over. If you haven’t stashed a car here, grab the free Vail Valley bus to get within hiking distance of your ride. K2’s lightweight touring ski, which comes complete with an ultra-light Paulownia/Maple Core, snow-repellent topsheet and All-Terrain Rocker for maneuverability across a variety of snow conditions, truly delivers on all counts. It’s perfect for ski mountaineers and advanced backcountry lovers seeking efficiency.